GRAPHIC BY JENNIFER DOUDNA/UC BERKELEYA decade, ago, when researchers started to unravel the function of a system called CRISPR (clustered, regularly interspaced, short palindromic repeats), which is found in bacteria and archaea, they had little inkling that it would lead to a tool that has taken the world of gene editing by storm. In the past year and a half, the method has quickly become the go-to technique for mutating and editing DNA across the animal kingdom: it works in pretty much every cell type tested so far, from human and mouse to zebrafish and fruit fly. It is so easy that not one but two research groups capitalized on CRISPR to individually mutate almost every gene in human cells (Science, 343:80-84, 2014; Science, 343:84-87, 2014). Most recently, CRISPR enabled researchers to engineer monkeys carrying specific gene disruptions, a feat that has been possible for decades in mice but was never before accomplished in primates (Cell, doi:10.1016/j.cell.2014.01.027, 2014). CRISPR functions as a defense system that protects bacterial and archaeal cells from viruses. CRISPR loci in these organisms’ genomes express small RNAs that match sequences in the genomes of invading viruses. When microbes are infected with one of these viruses, CRISPR RNA binds the viral genome through complementary sequence and brings CRISPR-associated enzymes, called Cas, to the viral DNA. The Cas enzymes are nucleases that cut the viral DNA, stopping the virus in its tracks. The beauty of putting the CRISPR/Cas system to work in other, nonbacterial cells is that it requires just two components: a Cas enzyme to snip target DNA—for example, inside a gene of interest—and an RNA molecule, called guide RNA (gRNA), which binds the target through complementarity. The gRNA is a shorter version of the CRISPR RNA made in bacterial cells. It forms a complex with Cas and directs the enzyme to the correct cleavage location. The DNA break usually causes mutations that inactivate the gene. But researchers can also wield the tool for gene correction and gene regulation by mixing in additional components or tweaking the activity of Cas. “Now, biologists who are not traditionally involved in gene-editing applications have a tool to investigate the effects of mutations, both in cells and in whole organisms,” says Jennifer Doudna, a biochemistry professor at the University of California, Berkeley, who, with colleagues, helped crack the mechanism of CRISPR in bacterial cells. Recently, Doudna’s group, which had not engineered whole organisms before, used the tool to make its first knockout mouse by performing gene editing in fertilized mouse eggs. For all its strengths, the CRISPR method appears to have one major downside: lack of specificity. Some gRNA molecules have been shown to bind to DNA that is only partially complementary to the gRNA. In this regard, other gene-editing methods—zinc-finger nucleases (ZFNs) and transcription activator-like effector nucleases (TALENs)—could outperform Cas-gRNA, because they recognize longer stretches of target DNA. However, ZFNs and TALENs, which are fusions of a nuclease enzyme and DNA-binding domain protein, are much trickier to clone and express in cells than gRNAs. Furthermore, researchers generally have to test about a dozen different TALENs and a few dozen different ZFNs with DNA-binding domains that recognize different target sites to find ones that work. The Scientist breaks down the process of Cas and gRNA for gene editing, highlighting the potential and the limitations of this popular new tool. How do I CRISPR my target? 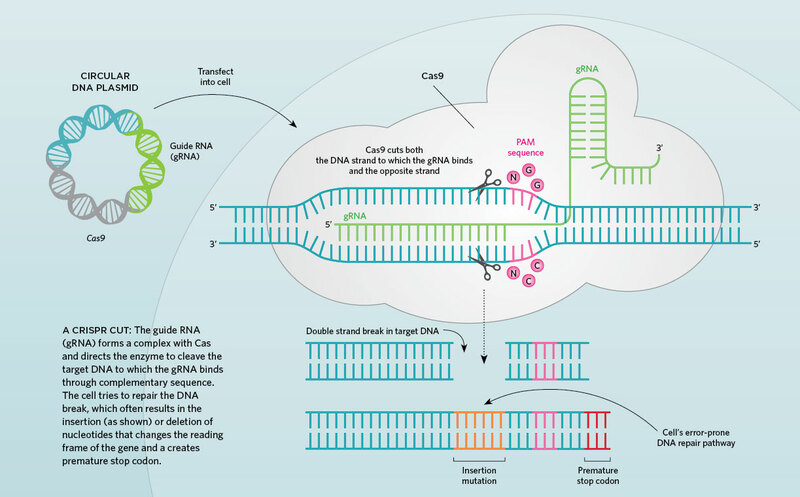 A CRISPR CUT: The guide RNA (gRNA) forms a complex with Cas and directs the enzyme to cleave the target DNA to which the gRNA binds through complementary sequence. The cell tries to repair the DNA break, which often results in the insertion (as shown) or deletion of nucleotides that changes the reading frame of the gene and a creates premature stop codon. See full infographic: JPG | PDFTHE SCIENTIST STAFFBecause of the simplicity of this system, all you need to do is transfect cells with plasmids that express Cas and the gRNA. Researchers use a variant of Cas, called Cas9, that is derived from a species of streptococcal bacteria. Cas9 is guided by RNA and can cleave DNA without the help of other proteins (Science, 337:816-21, 2012). Cas9 cuts both the DNA strand to which the gRNA binds and the complementary strand. You can buy a Cas9 plasmid from the plasmid repository at Addgene (price: $65) and transfect it directly into cells. The gRNA is about 80 nucleotides in length and consists of two regions: the first 20 nucleotides at the 5’ end of the gRNA are complementary to and bind the target DNA, while the remaining 60 or so nucleotides (length varies depending on the plasmid that expresses the gRNA) form a hairpin that is thought to help the gRNA complex with Cas9 and orient the gRNA for DNA binding. The gRNA, like Cas9, is expressed with the help of a plasmid, and several kinds are available from Addgene ($65 each). However, unlike with Cas9, you have to customize the expression plasmid for your target. You do this by designing an oligo that encodes the 20 bases that will bind the DNA target and that you will clone into the expression plasmid. (The 60 nucleotides that encode the remainder of the gRNA are already in the plasmid.) The only design requirement is that the gRNA encoded by the oligo must bind to DNA that has a sequence consisting of any nucleotide (indicated by N) followed by two cytosine nucleotides (–NCC) at its 5’ end. This is because gRNAs seem to bind best to DNA where the opposite strand contains a sequence consisting of any nucleotide followed by two guanine residues (–NGG), a sequence known as PAM (protospacer adjacent motif). Several programs are available that pick out eligible 20-base-pair stretches in a DNA region of interest, including MIT’s CRISPR Design [crispr.mit.edu]; E-CRISP [www.e-crisp.org/E-CRISP/designcrispr.html] developed by researchers at the German Cancer Research Center; and the ZiFiT targeter [zifit.partners.org/ZiFiT/ChoiceMenu.aspx]. The programs can also scan the whole genome and identify other sites that are similar to your target site, where the gRNA might bind off-target. However, only CRISPR Design and E-Crisp predict which gRNA sequences would be the most specific; ZiFiT does not. But because of the uncertainty surrounding these predictions—researchers are still unsure which properties of the oligo are critical for gRNA specificity—experts generally recommend testing at least three to five different gRNAs. Oligos are available from companies such as Sigma Aldrich and Integrated DNA Technologies and run about $10 to $20 each. Although Cas9 and gRNA can be expressed from separate plasmids, researchers also have the option of using a single plasmid that expresses both gRNA and Cas9, which could be helpful when working with cells that are hard to transfect, such as immune cells. The dual expression plasmid is also available through Addgene (price $65). However, for the purpose of quickly testing different gRNAs, you could use PCR to make a DNA fragment that codes for the gRNA and contains a promoter to drive its expression, and transfect the fragment into cells along with the Cas9 expression plasmid. This approach saves a couple of days by not having to clone the gRNA expression plasmid, says Feng Zhang, a synthetic biologist at the Broad Institute of MIT and Harvard, whose group developed the CRISPR Design Tool. Once you have expressed the gRNA and Cas9 enzyme in cells, the complex does the rest, handily cutting both strands of the target DNA. Although the cell’s DNA repair machinery tries to patch up the break, usually through a process called nonhomologous end joining, it often ends up removing or adding one or two nucleotides, causing a frame-shift mutation that stunts gene expression. By targeting sites near the beginning of the gene, you can prevent expression of all but the first smidgen of the gene. How do I test the efficiency of gene editing? As robust as the Cas9-gRNA complex can be, you may still want to look directly at whether it mutated your intended target and avoided nonspecific, or off-target, sites. Unlike ZFN and TALEN, which usually require testing many fusion proteins to find one that edits the intended target site, you can usually mutate your target with the first gRNA you try. In fact, Keith Joung, a pathologist at Massachusetts General Hospital, estimates that 90 percent of the gRNAs that his lab has tested mutated the intended targets. However, the complex is less reliable at avoiding off-target sites. A handful of studies published last year found that some gRNAs mutated off-target sites with as many as five mismatches. But other gRNAs are much more specific, and do not even appear to mutate off-target sites that have only one mismatch. Although there are no hard-and-fast rules yet to improve specificity, Joung says that picking gRNAs with the least similarity to potential off-target sites, as identified by the CRISPR Design Tool and the other programs, seems like a reasonable choice. A common application of the Cas9-gRNA tool is to inactivate a gene of interest in a population of cells. You can test to see whether the tool did what you intended by demonstrating the loss of the gene product or by looking for a cellular phenotype that shows the loss of that gene product’s function. In order to be sure that these effects are not due to mutating off-target sites, you can analyze the DNA target site and predicted off-target sites directly using the so-called Surveyor assay. This involves amplifying the target site by PCR and using a special endonuclease that only cleaves PCR products bearing mutations. Then you separate the mutated and unmutated DNA fragments on an agarose gel. Mutated fragments will be smaller because they have been cut. Alternatively, to make a clonal line of cells that all have the same mutation in your gene of interest, or mouse cells from which to engineer a knockout mouse, you will probably want to ensure that the Cas9-gRNA complex did not introduce a mutation at an unpredicted site. For these applications, you may want to do high-throughput sequencing of the entire genome. How can I optimize the specificity of my gRNA? In addition to selecting gRNA sequences that have minimal complementarity with nontarget sites, there are a couple of strategies for reducing off-target effects. One is to transfect the lowest amounts of Cas9 and gRNA expression plasmids (or gRNA PCR cassette) that are necessary for on-target activity. While these concentrations are enough to mutate your intended site, they may be insufficient for mutating nonspecific sites because off-target activity is usually less efficient than on-target. Another strategy is to use a mutant version of Cas9, called Cas9 nickase, which cuts only the strand of DNA that binds the gRNA. Unlike the double-stranded breaks exacted by normal Cas9, single-stranded nicks are usually correctly repaired by the cell. However, if you express Cas9 nickase in cells with a pair of gRNAs that bind different strands of the same DNA target, you make neighboring nicks whose repair leads to mutations. This approach could reduce off-target activity because it is unlikely that the two gRNAs would bind off-target sites close enough to each other to introduce a double nick. But the on-target efficiency could be worse than with normal Cas9 and a single gRNA. It may be impossible to eliminate all off-target effects, and many of them are probably in noncoding regions of the genome anyway. Instead, you can assume that inactivating the target gene caused the observed cellular effect if you can show that the same phenotype is associated with several gRNAs that bind different regions of the gene and presumably have different off-target effects, Joung says. Rescuing the phenotype of the inactivated gene by delivering the gene into cells on an expression plasmid is also a good validation strategy. What are different ways I can use Cas9-gRNA? The past year and half has shown that the sky is the limit for the Cas9-gRNA tool. In one take on the method, Zhang’s lab expressed five gRNAs targeting different genes in cells simultaneously from different expression plasmids, along with Cas9 from a separate expression plasmid, which cleaved all the target sites. “It should be possible to target even more than the 5 genes we have done so far,” Zhang says. Multiplexing with ZFNs and TALENs has been virtually unthinkable because targeting just a single site demands so much effort. Instead of gene inactivation, you can use the method to correct a gene. Gang Bao, a professor of biomedical engineering at the Georgia Institute of Technology, is working to correct the destructive single-nucleotide mutation that people with sickle cell anemia have in both copies of the beta-globin gene. Bao’s team is making double nicks in the gene using Cas9 nickase and a gRNA pair. They also transfect into cells a linear DNA fragment, usually between 400 and 800 bases, or a small plasmid that provides a good copy of the gene for the cells to use as a template for gene correction.